How would you compare an apple and an orange? Well, it’s obvious. Apples and oranges look and taste different; you could pretty much compare anything between them and find some difference. But one of these differences, one that has a huge implication, isn’t so obvious at all: the difference in FODMAP content. Apples contain high amounts of FODMAPs while oranges do not. What exactly is a FODMAP?? FODMAP stands for Fermentable Oligosaccharides Disaccharides Monosaccharides And Polyols. They are a group of short-chain carbohydrates commonly found in foods. Take a peek at the nutritional information on your next snack and chances are you’ll see fructose, lactose, fructans, galactans, sorbitol, or mannitol, all of which would fall under this category. Many other FODMAPs are not listed in required nutritional information, since they are basically indigestible. FODMAPs are of concern because they cannot be or are only poorly absorbed by the small intestine. They draw fluid into the bowels and in the colon (large intestine), they are fermented by commensal bacterias. 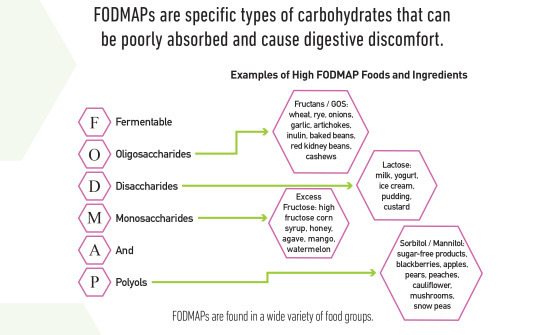 As a result, FODMAPs can lead to gas, bloating, abdominal pain/discomfort, diarrhea, and (paradoxically) constipation. Wait… people eat apples all the time and they’re fine! FODMAPs don’t actually cause any disorders or diseases. FODMAP malabsorption is a normal occurrence and occurs to the same extent in healthy individuals as they do in irritable bowel syndrome (IBS) warriors. Symptoms are just more readily induced in patients who suffer from IBS. As a result, reducing FODMAP intake can help relieve gastrointestinal symptoms. One way to do this is to try out the popular low-FODMAP diet. IBS is not a disease itself, but refers to a set of associated symptoms related to disturbances in bowel function. So while a low-FODMAP diet will not cure IBS, it has been shown to help reduce symptoms. A US study showed that a low-FODMAP diet improved health-related quality of life, activity impairment, and sleep quality. In fact, specific symptoms in IBS patients such as abdominal pain, bloating, passage of gas, nausea, heartburn, and lethargy were significantly lower when the patients were on a low-FODMAP diet. What about inflammatory bowel disease (IBD)? While thorough research has not yet been conducted, studies have shown that fructose malabsorption is more frequent in patients with Crohn’s disease and Ulcerative Colitis. This suggests that IBD patients, like those who suffer from IBS, can find relief from a low-FODMAP diet. The low-FODMAP diet is conducted by eliminating high FODMAP foods for a period of weeks to months, then slowly reintroducing FODMAP subgroups one at a time to test how they affect symptoms. This reintroduction can be repeated to test a range of different foods. To begin the diet, the best approach is to consult a dietician who is well-versed in the diet. As with the case of apples and oranges, the FODMAP contents of different foods isn’t always obvious. Professional assistance can help in other ways as well. You can seek a physician to run a hydrogen breath test, which can determine the degree of lactose and fructose malabsorption to help with deciding how you should limit certain foods in your diet. The Monash University Low-FODMAP Diet smartphone app provides a quick way to look up the FODMAP information of different foods. What if I don’t want or can’t get professional help? If depending on professional help isn’t your cup of tea, the best place to start is with a food diary. Tracking everything you eat will help with working through the different phases of the diet to find the links between the foods you eat and the symptoms you suffer. Furthermore, without assistance from a dietician, it is essential to educate yourself about food and recipes that are low versus high in FODMAP content. A useful digital tool to help you familiarize yourself with FODMAPs in different foods is The Monash University Low-FODMAP Diet smartphone app. 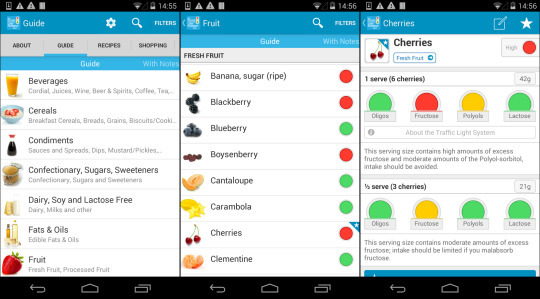 The easy-to-use application developed by Monash University, where researchers developed the low-FODMAP diet, can be used to view the FODMAP information of many common foods. While there’s increasing evidence of the benefit of a low-FODMAP diet to control symptoms of IBS, the long-term effects and side effects of FODMAP restriction need to be further understood. Still, for those suffering from IBS or IBD, restricting FODMAPs in the diet can be a relatively simple and effective way to manage their symptoms. Do you think you could make the change to a low-FODMAP diet?